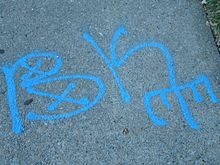 The Crips are one of the largest and most violent associations of street gangs in the United States. With an estimated 30,000 to 35,000 members in 2008, they have been involved in murders, robberies and drug dealing, among other crimes. Stanley Tookie Williams met Raymond Lee Washington in 1969, and the two decided to unite their local gang members from the west and east sides of South Central Los Angeles in order to battle neighboring street gangs. Most of the members were 17 years old. Williams discounted the sometimes cited founding date of 1969 in his memoir, Blue Rage, Black Redemption. Gang activity in South Central Los Angeles has its roots in a variety of factors dating back to the 1950s and '60s, including post-World War II economic decline leading to joblessness and poverty, racial segregation leading to the formation of black "street clubs" by young African American men who were excluded from organizations such as the Boy Scouts, and the waning of black nationalist organizations such as the Black Panther Party and the Black Power Movement. By 1978, there were 45 Crips gangs, called sets, operating in Los Angeles. They were heavily involved in the production of PCP, marijuana and amphetamines. On March 11, 1979, Stanley Tookie Williams, a member of the Westside Crips, was arrested for four murders and on August 8, 1979, Raymond Washington was gunned down. Washington had been against Crip infighting and after his death several Crip sets started fighting against each other. The Crips leadership was dismantled prompting a deadly gang war between the Rollin' 60 Neighborhood Crips and Eight Tray Gangster Crips which began causing nearby Crip sets to choose sides and align themselves with either the Gangster Crips or Neighborhood Crips waging an all out war in South Central and other cities. The East Coast Crips and the Hoover Crips directly severed their alliance after Washington's death. By 1980, the Crips were in turmoil, warring with the Bloods and against each other. The growth and power of the gang really took off in the early 1980s when crack cocaine hit the streets. In the early 1980s, Crips sets began distributing crack cocaine in Los Angeles. The huge profits from distribution of crack cocaine induced many Crips to establish new markets in other cities and states. As a result, Crip membership grew steadily and by late 1980s it was one of the largest street gangs in the country. In 1999, there were at least 600 Crips sets with more than 30,000 members transporting drugs in the United States. Some sources suggest that the original name for the alliance, "Cribs", was a name narrowed down from a list of many options, and chosen unanimously from three final choices, which included the Black Overlords, and the Assassins. Cribs was chosen to reflect the young age of the majority of the gang members. The name "Cribs" evolved into the name "Crips" when gang members began carrying around canes to display their "pimp" status. People in the neighborhood then began calling them cripples, or "Crips" for short. A Los Angeles Sentinel article in February 1972 referred to some members as "Crips" (for cripples). Another source suggests "Crips" may have evolved from "Cripplers", a 1970s street gang in Watts of which Raymond Washington was a member. The name had no political, organizational, cryptic, or acronymic meaning, though some have suggested it stands for "Common Revolution In Progress", a backronym. According to the film Bastards of the Party directed by a member of the Bloods, the name represented "Community Revolutionary Interparty Service" or "Community Reform Interparty Service". Williams, in his memoir, further refuted claims that the group was a spin-off of the Black Panther Party or formed for a community agenda, the name "depicted a fighting alliance against street gangs—nothing more, nothing less." Washington, who attended Fremont High School, was the leader of the East Side Crips, and Williams, who attended Washington High School, led the West Side Crips. Williams recalled that a blue bandana was first worn by Crips founding member Buddha, as a part of his color-coordinated clothing of blue Levi's, a blue shirt, and dark blue suspenders. A blue bandana was worn in tribute to Buddha after he was shot and killed on February 23, 1973, which eventually became the color of blue associated with Crips. The Crips have over 800 sets with 30,000 to 35,000 members and associate members, including more than 13,000 members in Los Angeles.[when?] The states with the highest estimated number of "Crips sets" are California, Texas and Oklahoma and Missouri . Members typically consist of young African-American men, with some members being white, Hispanic, Asian, and Pacific Islander. In 1992 the LAPD estimated 15,742 Crips in 108 sets; other source estimates were 30,000 to 35,000 in 600 sets in California. Crips have served in the United States armed forces and on bases in the United States and abroad. By 1971, a gang on Piru Street in Compton, California, known as the Piru Street Boys, was formed and associated themselves with the Crips as a set. After two years of peace, a feud began between the Piru Street Boys and the other Crip sets. It would later turn violent as gang warfare ensued between former allies. This battle continued and by 1973, the Piru Street Boys wanted to end the violence and called a meeting with other gangs that were targeted by the Crips. After a long discussion, the Pirus broke all connections to the Crips and started an organization that would later be called the Bloods, a street gang infamous for its rivalry with the Crips. Since then, other conflicts and feuds were started between many of the remaining sets of the Crips gang. It is a popular misconception that Crips sets feud only with Bloods. In reality, they fight each other—for example, the Rolling 60s Neighborhood Crips and 83 Gangster Crips have been rivals since 1979. In Watts, Los Angeles, the Grape Street Crips and the PJ Watts Crips have feuded so much that the PJ Watts Crips even teamed up with a local Blood set, the Bounty Hunter Bloods, to fight against the Grape Street Crips. In the mid 1990s, the Hoover Crips rivalries and wars with other Crip gangs caused them to become independent and to refrain from using the Crip name, calling themselves the Hoover Criminals instead of Hoover Crips. The primary rival of the Crips is the Bloods street-gang. The rivalry dates back to the 1960s when Raymond Washington and several other Crips confronted Sylvester Scott and Benson Owens, students at Centennial High School. In response to the attack, Scott, who lived in Compton, established the Piru street-gang, the first "Bloods" street gang. Owens established the West Piru street-gang. The Bloods street-gang was initially formed to provide members protection from the Crips. In late 1972, several gangs that felt victimized by the Crips due to their escalating attacks joined the Piru Street Boys to create a new federation of non-Crip gangs which would later become known as Bloods. Between 1972 and 1979, the rivalry between the Crips and Bloods would grow, accounting for a majority of the gang-related murders in southern Los Angeles. Gang members of the Bloods and Crips occasionally fight against each other and are responsible for a significant portion of gang-related murders in Los Angeles. In the late 1980s and early 1990s, as many Crip gang members were being sent to various prisons across the country, an alliance was formed between the Crips and the Folk Nation in Midwest and Southern U.S. prisons. This alliance was established as a means of protecting gang members incarcerated in state and federal prison systems. This alliance is strongest within the prisons however, and is less effective on the outside. The alliance between the Crips and Folks is known as "8-ball". A broken "8-ball" would indicate a disagreement or "beef" between Folks and Crips. 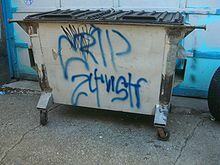 Some practices of Crip gang life generally include graffiti and substitutions and deletions of particular letters of the alphabet. The letter "b" in the word "blood" will be "disrespected" among certain sets and written with a cross inside it because of its association with the enemy. The letters "CK", which stand for "Crip killer", will be avoided and substituted with a double "cc", and the letter "b" will be replaced. For example, the words "kick back" will instead be written as "kicc bacc". Many other letters are also altered due to symbolic associations. Crips traditionally refer to each other as "Cuzz", which itself is sometimes used as a moniker for Crip. "Crab" is the most disrespectful epithet to call a Crip, and can warrant fatal retaliation. Crips in prison modules during the 1970s and 1980s would sometimes speak in Swahili to maintain privacy from guards and rival gangs. ^ a b c d e f g h U.S. Department of Justice, Crips. ^ a b "Appendix B. National-Level Street, Prison, and Outlaw Motorcycle Gang Profiles - Attorney General's Report to Congress on the Growth of Violent Street Gangs in Suburban Areas (UNCLASSIFIED)". www.justice.gov. Retrieved 21 March 2017. ^ a b "Los Angeles-based Gangs — Bloods and Crips". Florida Department of Corrections. Archived from the original on 2002-10-27. Retrieved 2009-06-21. ^ "Crips". Gang Prevention Services. Archived from the original on 2009-05-12. Retrieved 2009-06-21. ^ "Black Gangster Disciples". Gang Prevention Services. Archived from the original on 2011-02-05. Retrieved 2009-06-21. ^ "Major Prison Gangs(continued)". Gangs and Security Threat Group Awareness. Florida Department of Corrections. Archived from the original on 2010-03-12. Retrieved 2009-06-21. ^ "Juggalos: Emerging Gang Trends and Criminal Activity Intelligence Report" (PDF). Info.publicintelligence.net. 15 February 2011. Retrieved 11 December 2017. ^ a b c d Williams, Stanley Tookie; Smiley, Tavis (2007). Blue Rage, Black Redemption. Simon & Schuster. pp. xvii–xix, 91–92, 136. ISBN 1-4165-4449-6. ^ Stacy Peralta (Director), Stacy Peralta & Sam George (writers), Baron Davis et al. (producer), Steve Luczo, Quincy "QD3" Jones III (executive producer) (2009). Crips and Bloods: Made in America (TV-Documentary). PBS Independent Lens series. Retrieved 2009-05-15. ^ "Timeline: South Central Los Angeles". PBS (part of the "Crips and Bloods: Made in America" TV documentary). April 21, 2009. Retrieved May 15, 2009. ^ Sharkey, Betsy (2009-02-06). "Review: 'Crips and Bloods: Made in America'". Los Angeles Times. Retrieved May 16, 2009. ^ Cle Sloan (Director), Antoine Fuqua and Cle Sloan (producer), Jack Gulick (executive producer) (2009). Keith Salmon (ed.). Bastards of the Party (TV-Documentary). HBO. Retrieved May 15, 2009. ^ a b "Gangland". google.co.in. ^ "Black Los Angeles". google.co.in. ^ "Los Angeles". Inside. National Geographic Channel. Archived from the original on August 4, 2009. Retrieved June 21, 2009. ^ Dunn, William (2008). Boot: An LAPD Officer's Rookie Year in South Central Los Angeles. iUniverse. p. 76. ^ Covey, Herbert. Crips and Bloods: A Guide to an American Subculture: A Guide to an American Subculture. p. 9. ^ "Gangs Increasing in Military, FBI Says". Military.com. McClatchy-Tribune Information Services. 2008-06-30. Retrieved 2009-06-21. ^ Capozzoli, Thomas and McVey, R. Steve (1999). Kids Killing Kids: Managing Violence and Gangs in Schools. St. Lucie Press, Boca Raton, Florida, p. 72. ISBN 1-57444-283-X. ^ "War and Peace in Watts" Archived 2007-04-16 at the Wayback Machine (2005-07-14). LA Weekly. Retrieved 2007-05-04. ^ Smith, Debra; Whitmore, Kathryn F. (2006). Literacy and Advocacy in Adolescent Family, Gang, School, and Juvenile Court Communities. Lawrence Erlbaum Associates. ISBN 0-8058-5599-8. ^ Simpson, Colton (2005). Inside the Crips: Life Inside L.A.'s Most Notorious Gang. St. Martin's Press. p. 280. ISBN 978-0-312-32930-3. ^ Simpson, Colton (2005). Inside the Crips: Life Inside L.A.'s Most Notorious Gang. St. Martin's Press. pp. 122–124. ISBN 978-0-312-32930-3. Wikimedia Commons has media related to Crips.